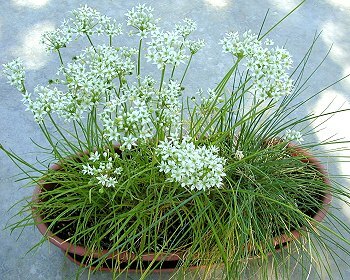 Chives is the common name of Allium schoenoprasum, the smallest species of the edible onions. A perennial plant, it is native to Europe, Asia and North America. A. schoenoprasum is the only species of Allium native to both the New and the Old Worlds. The name of the species derives from the Greek skhoínos (sedge) and práson (leek). 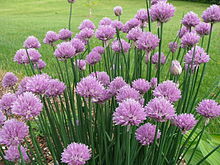 Its English name, chives, derives from the French word cive, from cepa, the Latin word for onion. 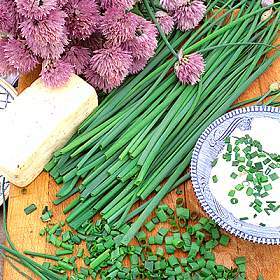 Chives are a commonly used herb and can be found in grocery stores or grown in home gardens. 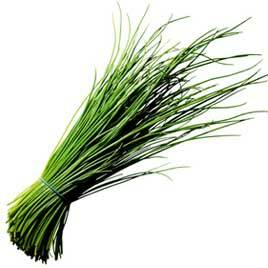 In culinary use, the scapes are diced and used as an ingredient for fish, potatoes, soups, and other dishes. Chives have insect-repelling properties that can be used in gardens to control pests.